Happiness Unlimited...: Why should you keep everything in its right place? 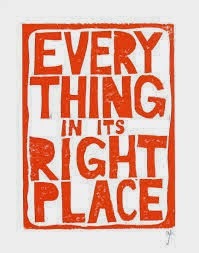 Why should you keep everything in its right place? It is so simple, but most of us decide to complicate things, and take stress as a natural "gift" in our everyday life. Searching for a stapler, comb, your car keys or door keys is nothing uncommon in most house holds. While a deeper relationship among family members may be an unexpected positive bi-product (since all of them are involved in one single purpose of searching), the chances of stressful search with a blame game is a more likely outcome. The simple reason is that when the search is on, the family usually does not have enough time to take the search operation positively. It takes 30 seconds to keep the car key at the right place. It also takes 30 seconds to keep the car keys at any other random place in the house. So, why bother about keeping things at the right place? The difference is in the retrieval time. The retrieval time for a thing kept in its place is still 30 seconds, while the retrieval time for a thing kept "anywhere" in the house depends on your stars that day, support from your family members, and your ability to handle stress. This retrieval time could be anywhere from 30 seconds to 30 minutes or even more, not to mention the stress created and the physical "irreparable" damage this stress does on your body. More wear and tear of your vehicle. Potential impact on your appraisal and the next increment. If you are still telling me that you are running short of time in life and life is stressful, and these are minor things in life, it is up to you to take them lightly at your own peril. It is up to you to save time. And just like money, time saved is time earned. Stress saved is health earned. Want to earn time and health and money for yourself? Then remember that every object (whether it is a pencil or a rubber or a pin or a needle or a thread or a book or your socks and shoes or your towel... or any other object that you can see from your naked eyes) has an "address" within your house. If you drop the objects at their right address in your house, they would "appear" before you at your command, when you call them in need. You can take yourself to a level where you can retrieve the objects even with your eyes closed. Life will definitely become easier, free flowing and happier. Small things will make a big difference to the happiness content in your life. Need help in understanding how you can lead a happier life by getting more organised?